Michael Maltzan’s Star Apartments in Los Angeles provides 102 units for housing the homeless. Image via Michael Maltzan Architects. Housing First, a federal policy for ending chronic homelessness that grew out of initiatives in Los Angeles and New York in the late 1980s and early 1990s, provides what appears to be the most effective solution to homelessness in the United States: actually housing people. Since implementing Housing First programs in Utah in 2005, Salt Lake City reported up to a 91% reduction in their rate of the chronically homeless. 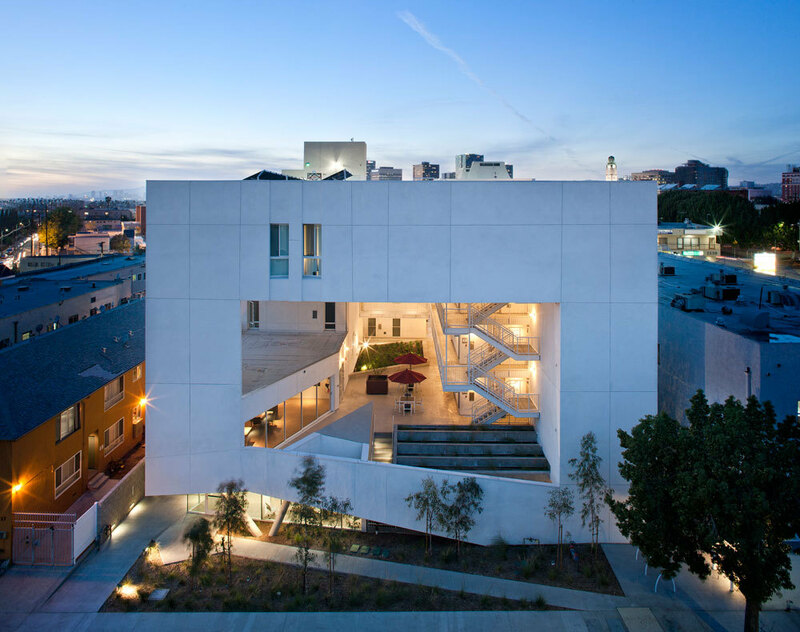 In Los Angeles, architects like Michael Maltzan and Brooks + Scarpa have designed structures that are either partially or fully dedicated as homes for a formerly transient population, and include support networks and rehabilitation programs. However, unlike many other housing for the homeless initiatives, it isn’t required for tenants to be progressing through those programs as a precondition to receiving a home. Under Housing First, city governments have realized that housing the homeless is often far less of a financial strain than not housing them—given expenses due to things like hospital visits and jail time, HUD estimates that a homeless individual costs the government anywhere between $30,000 and $50,000 every year. The Sunrise Metro Apartments in Utah. Image via ascentconstruction.com. As the first building project initiated under Utah’s Housing First policy, Sunrise Metro Apartments is a relatively traditional residential apartment building with 100 units. According to an NPR report, the relatively small scale of Salt Lake City itself, along with the political efforts of respected conservative community member Lloyd Pendelton, fostered a surprisingly conducive political environment that accelerated the approval process of such Housing First policy—which, in socially right-leaning Utah, was a hard sell otherwise. In many other cities, the greatest obstacle to creating housing for the homeless has been the lack of a unified political direction to join money, resources, and available space. Since Salt Lake’s program was implemented in 2005, the number of the state’s chronically homeless has dropped from 2,000 to 200. Kiss + Cathcart’s “The Lee.” Image via Kiss + Cathcart. A non-profit organization known as Breaking Ground (formerly Common Ground) has refurbished several formerly dilapidated buildings within Manhattan into permanent housing for the homeless, including the Times Square Hotel at 8th Street and 43rd Avenue, The Prince George, The Christopher, and The Andrews. The group’s efforts uphold the goals of the Housing First program, which is to not only provide housing, but a supportive environment. 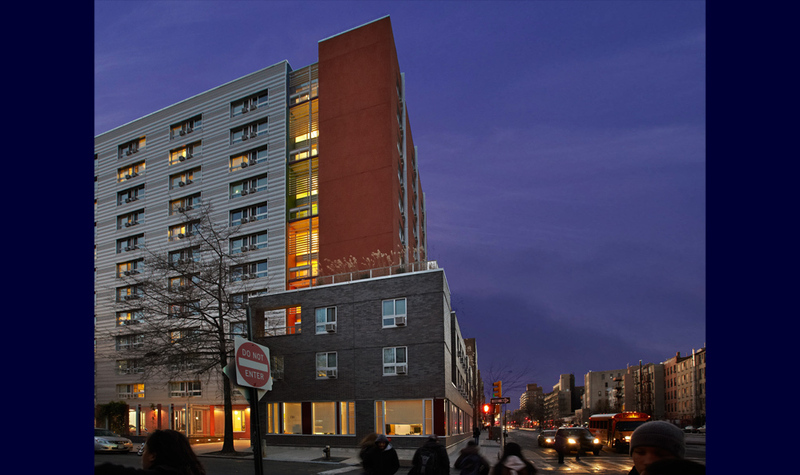 In 2011, Kiss + Cathcart finished The Lee for Breaking Ground, a 100,000 square foot, highly energy-efficient building with 264 units on the Lower East Side. According to the Coalition for the Homeless, the success of the permanent supportive housing programs has been estimated to be 90%, a figure which is determined by the number of formerly homeless who after being introduced into the program remain housed. 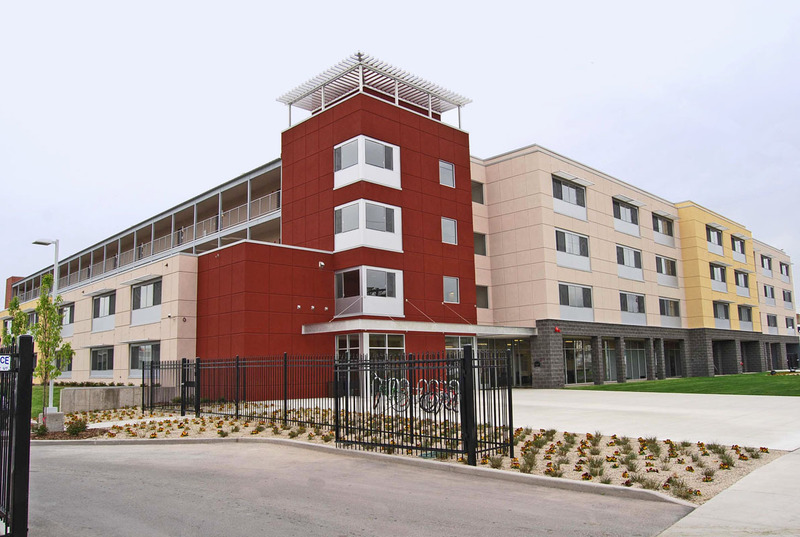 Othello Village, unlike Salt Lake City’s Sunrise Metro Apartments, is not a permanent structure, but rather is an encampment of eight tiny homes (some of which will be refurbished shipping containers) and about three times as many tents on platforms grouped together near the Othello Light Rail Station. The encampment, which opened in 2016, is legally allowed to operate for one year, at which time it may seek renewal for another year. Much as with Utah’s Housing First program, caseworkers select families to place within each structure based on their histories. The houses, such as they are, measure eight by twelve feet, and feature vinyl flooring and light insulation. According to the Seattle Times, Seattle’s approach to building permanent housing for the homeless has been scattershot: although it has authorized micro-apartments in many areas for lower-income groups, it still has a way to go in comparison to other cities. The Six by Brooks + Scarpa in Los Angeles provides 52 apartments to the homeless. 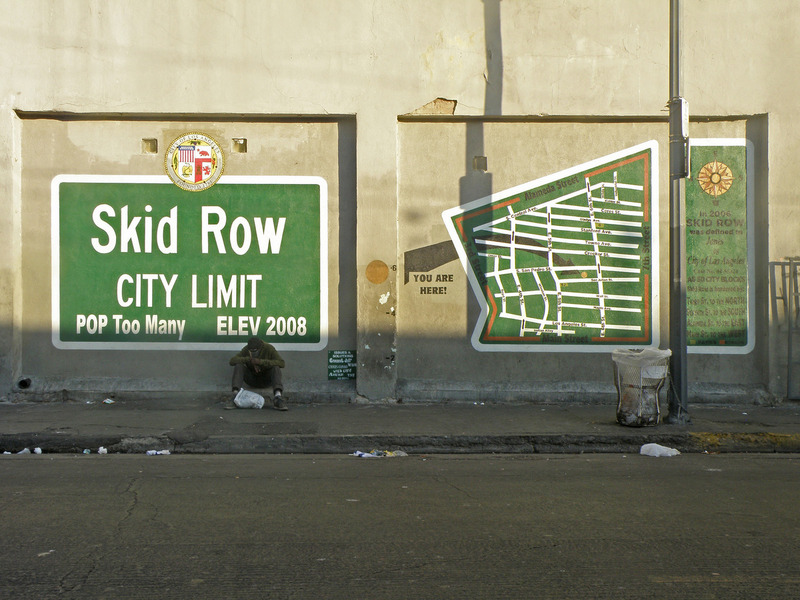 Image via Skid Row Housing Trust. The Skid Row Housing Trust currently oversees 1,800 homes spread over 25 new and renovated buildings throughout the city, including Michael Maltzan’s 2013 Star Apartments, the Six by Brooks + Scarpa Architects and the New Pershing Apartments by Killefer Flammang. Many of the buildings that the Trust manages are original Single Room Occupancy (SRO) hotels, which since the 1980s had been used in high-need areas to provide housing and social services to the homeless population. However, the city’s recent increase in the homeless population—twelve percent in the last two years, according to the L.A. Times—has amplified the urgency of the issue. 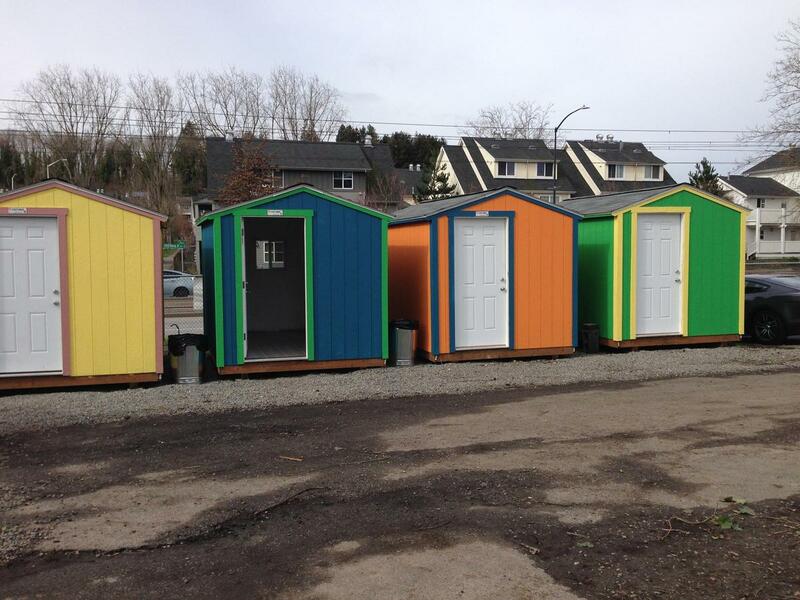 A few rogue designers, such as Elvis Summers, have built tiny houses for the homeless, but these have been seized by the city for not being up to code. Meanwhile, the number of people living under freeway overpasses—including the 101 freeway overpass on Alvarado Street in Echo Park and the 10 freeway overpass on Venice in Culver City—has visibly increased. Skid Row, Los Angeles. Image via flickr/Laurie Avocado. Note: Homeless population figures for Salt Lake City provided by NPR. Homeless population figures for Seattle, Los Angeles, and New York City provided by National Alliance to End Homelessness. This piece is part of Archinect’s special May 2016 theme, Help. How can architecture help create more equitable societies? More related news here. View the original post on Archinect.com.